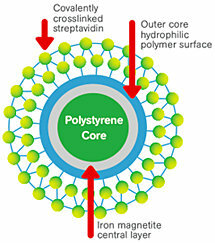 NanoLink™ Streptavidin Magnetic Beads are the highest binding beads on the market (>12 nmol/mg). They provide better signal with lower background noise. Magnetic Beads encapsulated with Solulink's 4FB linker for covalent immobilization of biomolecules to be used in affinity purification applications. NanoLink™ 4FB Magnetic Microspheres are encapsulated, nanometer-sized, super-paramagnetic particles activated with stable 4FB (4-formylbenzamide) linkers. 4FB linkers readily react with HyNic activated biomolecules for covalent immobilization of protein, peptides, DNA, RNA oligonucleotides and/or oligosaccharides. The high surface area and low non-specific binding of NanoLink™ particles are ideal for covalent immobilization. These microspheres are validated and optimized for use with high-throughput magnetic platforms as well as for simple benchtop applications using a magnetic stand.